We all know about air conditioning system. The automotive air conditioning system is also works on the reverse Brayton or Rankine cycle. As like all air conditioning system the aim of automotive air conditioning is to control the temperature and humidity of the atmospheric air and circulate the same in the automobile. The automotive air conditioning system consists a refrigeration system, air circulation and distribution system and a control system. The refrigeration system cool down the air which include many other parts like compressor,condenser etc. The air circulating system circulate this cooled air into the car which include blower, air duct etc.The controlling system used to control the temperature of the car by sensing it and control the refrigerating system. The automotive air conditioning system includes thecompressor, condenser, evaporator, receiver-dehydrator and connecting lineswhich includes expansion valve, orifice tube, suction throttling valve,positive operating absolute valve, evaporator pressure regulator valve, thermal sensor, high pressure cut off switch and cycling compressor switch. In old days Freon 12 was used as refrigerant but now it is replaced by alternative refrigerant like R134a. The layout of refrigerating system is as shown in figure. 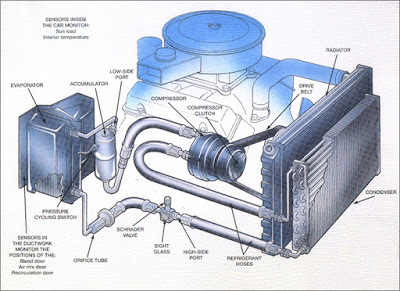 The working of automotive air condition system is similar to all other air conditioning system. The refrigerant vapour from the evaporator is compressed to high pressure by the compressor. The compressor is driven by the engine through a belt drive. It is connected by a electromagnetic clutch witch serve engage and disengage the compressor required. A variable displacement AC compressor is sometime used to match compressor capacity to varying cooling requirement. Refrigerant pressure and temperature increases in the compressor and convert it into vapour form. This high pressure and temperature refrigerant vapour from the compressor then discharge to the condense, which is a heat exchanger situated in front of vehicle. In the condenser the refrigerant liberate heat and convert into liquid form. Sometime the ram air is not sufficient so an extra engine or electric driven fan is used to cool down the refrigerant. This cooled but high pressure refrigerant allow to pass form dehydrator to extract any moisture. Dry refrigerant liquid is then made to pass through expansion valve mounted at the inlet side of the evaporator. The expansion valve allows the refrigerant liquid to expand to low pressure in the evaporator. The process of expansion to low pressure makes the refrigerant to evaporate and thereby cool the evaporator. A sensing devices, called temperature tube signals the diaphragm in the expansionvalve to vary orifice size depending upon the refrigerant temperature at the evaporator outlet, thus achieving automatic temperature control. The evaporator is similar in construction to the condenser. The same circulation and distribution system as used for ventilation and heating system. The air from the blower is forced to flow over the evaporator coils which remove the latent heat of vaporization, moisture and impurities form the air. Condenser moisture with the impurities fro the evaporator drips into a try form where the same are drained out. This system is microprocessor based and depending upon input signals outside air temperature, inside air temperature, mode selection and desired temperature setting, automatically controls the air mixer valve, re-circulation valve etc. 1. Do not use AC fresh air mode open always, since this mode is for occasional use just to release the air in circulation for a long time. 2. Never operate AC with heater on. 3. Never run AC without refrigerant otherwise compressor may seize. 4. Do not leave AC joints open which may cause the moisture to enter the system. 5. Do not charge the refrigerant in the AC system before flushing. 6. Never switch on the AC at high speeds, which may result in the seizing of compressor. 1. Clean the condenser during normal servicing. 2. Maintain correct refrigerant level. Less refrigerant would result in less cooling, while excessive would also result lesser cooling and excessive tripping. 3. Top up the compressor with adequate oil. 4. Clean the evaporator periodically. 5. 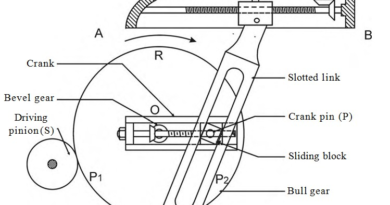 Maintain proper belt tension. A loose belt will slip whereas overtight belt would cause noise and premature compressor failure. Today we have discussed the Air condition system used in car. After reading this article if you have any query, put it into comment box. If you like this article, don’t forget to share it on social networks. Subscribe our website for more informative articles. Thanks for reading it. The role of the vehicle’s air conditioning system is to dry the outside air coming into the speed machine and cool the air and allow the air to pass through the air conditioning vents. Sometimes, the mold is formed due to the presence of fungal elements. By using a mold remover, you can clear this problem. Look- the air conditioning system does not get malfunctioned so often. Better you hire a car technician and service at regular intervals to keep the AC unit serviceable and prolong the longevity.